View of the Kasta tomb (photo: Gregoris Tsokas). 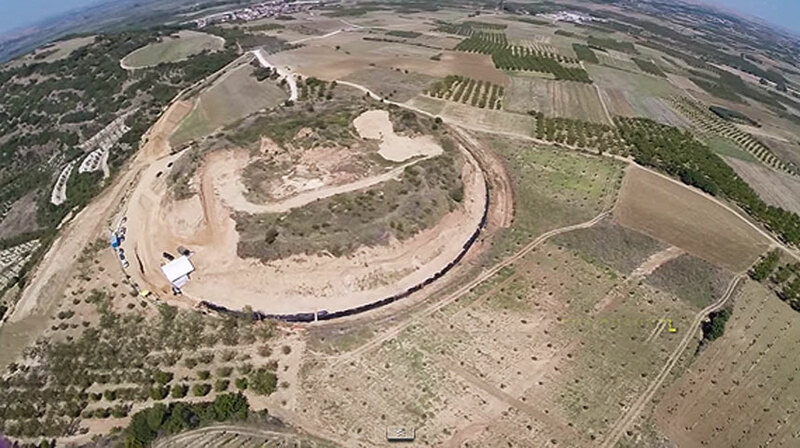 “In about three years time the Kasta tomb monument in Amphipolis will become accessible to the public. We are pushing ahead both with the Region of Central Macedonia and the Interreg cross border cooperation programme”, said the Minister of Culture and Sports Lydia Koniordou to journalists on the sidelines of the presentation of the National Archaeological Museum’s new temporary exhibition “Hadrian and Athens. Conversing with an ideal world”. When asked by journalists if the available funds are sufficient (“almost 1.5 million Euros from the Region and 1.3 million Euros from the cross border programme” as Ms Koniordou said), the minister pointed out that “They are sufficient for the site’s accessibility and its configuration. Of course it is not sufficient for everything” she said, noting that “it is a very complex monument that needs to be gradually restored and studies made regarding the outcomes. It is a project that will be constantly monitored as it is being restored”, she added. Finally, as mentioned at the meeting, the Central Archaeological Council (CAC) is expected shortly to approve a study for the restoration of the monument’s sculptural decoration, while work on its protection is being done since 2015. It should be noted that in Thessaloniki on Monday, November 20, Ms. Koniordou and the Regional Governor of Central Macedonia Ap. Tzitzikostas, announced the inclusion in the new NSRF of the project for the conservation, stabilizing, restoration and promotion of the Kasta Tomb in Amphipolis. The restoration and reconstruction of the monument is expected to be completed in a year starting from the end of 2018 to the beginning of 2019. It will be followed by the conservation of the monument and all its surfaces. Specifically, the frescoes, floor and decoration will be preserved and enhanced, while a protective shell is to be constructed.